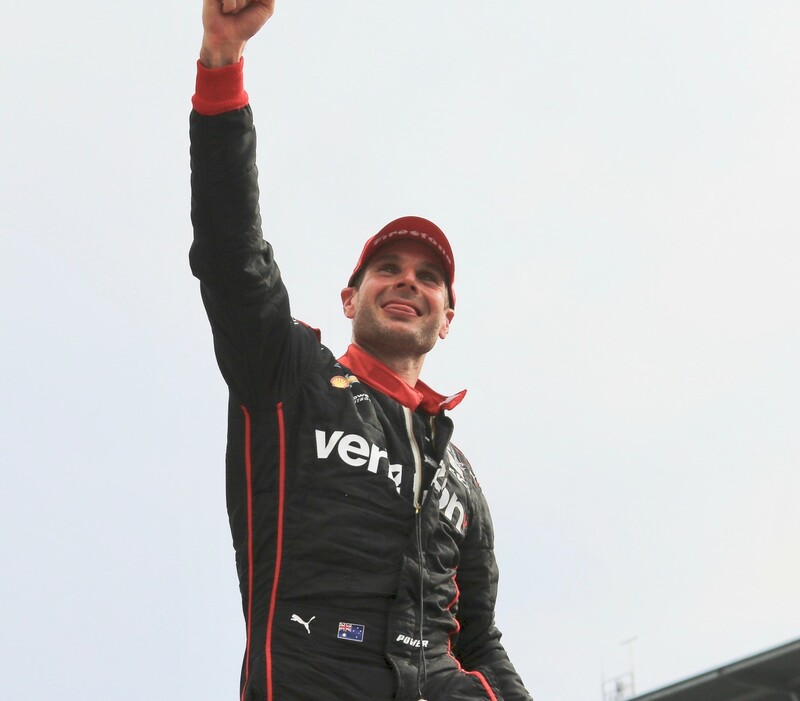 Will Power/No.12 Verizon Team Penske Chevrolet won the Indianapolis Grant Prix at Indianapolis Motor Speedway from the pole position for the third time. It was his 33rd win, 30 of which have been with Penske. He led three times for 56 laps, the most of the record-breaking seven leaders. Many of the lead changes were courtesy of pit stop recycling. In the waning laps, Power kept stretching is lead over Dixon, going from 2.3162 seconds on Lap 78 to 2.7840 seconds by Lap 83. Dixon gave it the old college try and the Margin of Victory was whittled to 2.2443 seconds. 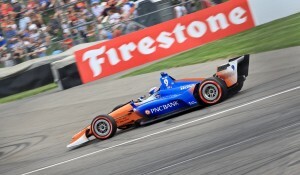 Power turned a couple of fastest race laps, including the fastest leader lap of 123.231 mph/1:10.5687 on Lap 9; but the overall fastest lap was turned by runner-up Scott Dixon/No.9 PNC Bank Chip Ganassi Racing Honda, whose fastest lap of 124.423 mph/1:10.5687 was turned on Lap 15. Third and top Rookie was Wickens who had started second and led once for 20 laps. He had been running second on Lap 63, when third place Dixon made a smooth move on Wickens at the end of the front straight on Lap 64, which got the crowd’s attention. 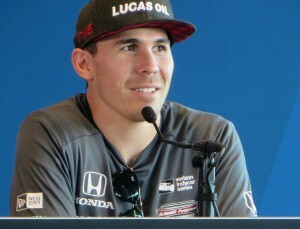 Dixon said “I just was hoping that he was maybe concentrating on saving fuel because I knew it was going to be fairly difficult to get the mileage that we needed to, and I thought I’d try it early to be aggressive and try and get the fuel mileage later if we needed to, so that was basically the strategy. It’s very hard to defend if someone behind you is on overtake and you’re not, just the rate of speed, especially on long straights like this it’s almost impossible. Yeah, it was a pretty basic one. That’s what it was. 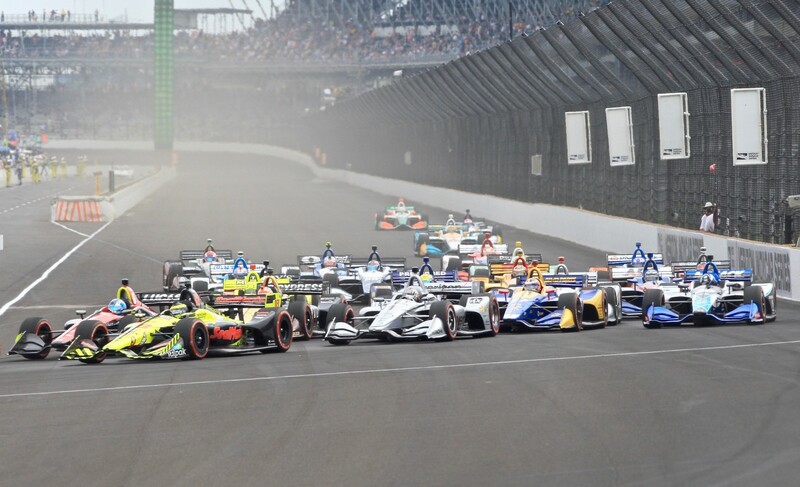 Fourth and fifth were Sebastien Bourdais/No.18 Team SealMaster Dale Coyne Racing Honda and Alexander Rossi/No.27 NAPA AUTO PARTS Andretti Autosport Honda. All 24 drivers finished, 21 of them on the lead lap. There were two cautions. The first lasted three laps on the start when two cars came together in Turn Two. 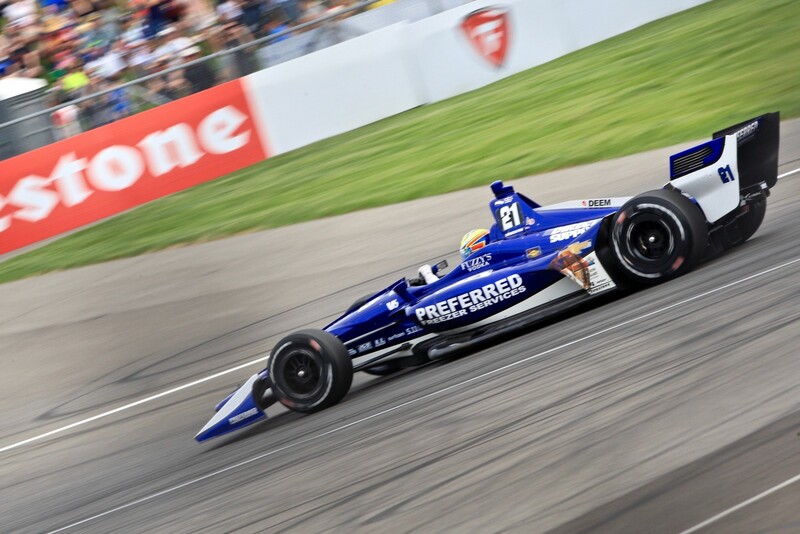 Rookie Jordan King/No.20 Fuzzy’s Vodka Ed Carpenter Racing Chevrolet had been having such a good weekend up until this point until he and Simon Pagenaud/No.22 Menards Team Penske Chevrolet came together. 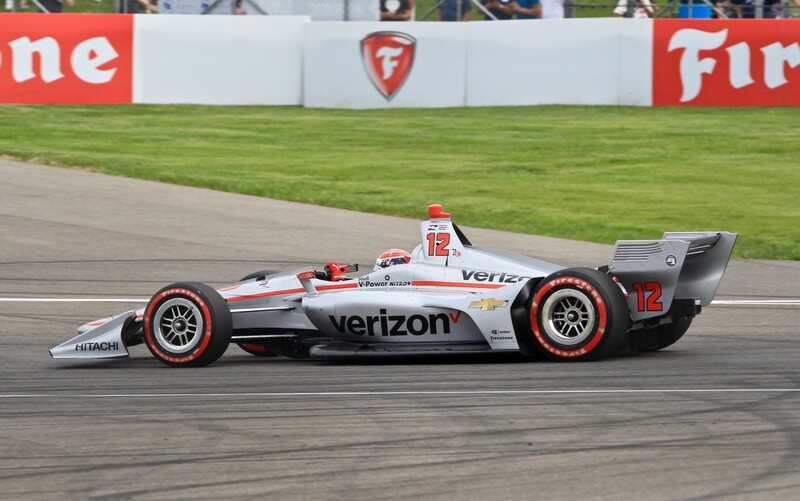 Pagenaud powered through the contact in the grass and kept on going. King had to be helped by the Emergency Crew and restarted, allowing him to continue, albeit two laps down. He finished last, and Pagenaud salvaged an eighth place finish after starting seventh. The only Steward’s action was a Drive-through penalty for Spencer Pigot/No.21 Preferred Freezer Service Ed Carpenter Racing Chevrolet for avoidable contact in his incident with Sato in Turn Six. It was a eye-catching contact, with Pigot going four-wheels in the air over the berm, coming down with quite a bounce. Sato continued, as did Pigot, who finished fifteenth. There were a number of incidents over which the Stewards took No Action. Gaby Chaves/No.88 Harding Group Chevrolet and Charlie Kimball/No.23 Fiasp Carlin Chevrolet; and Kimball and Ed Jones/No.10 NTT Data Chip Ganassi Racing Honda in Turn One. A record number of lead changes occurred during the first half of the race, mostly due to Pit Stops. 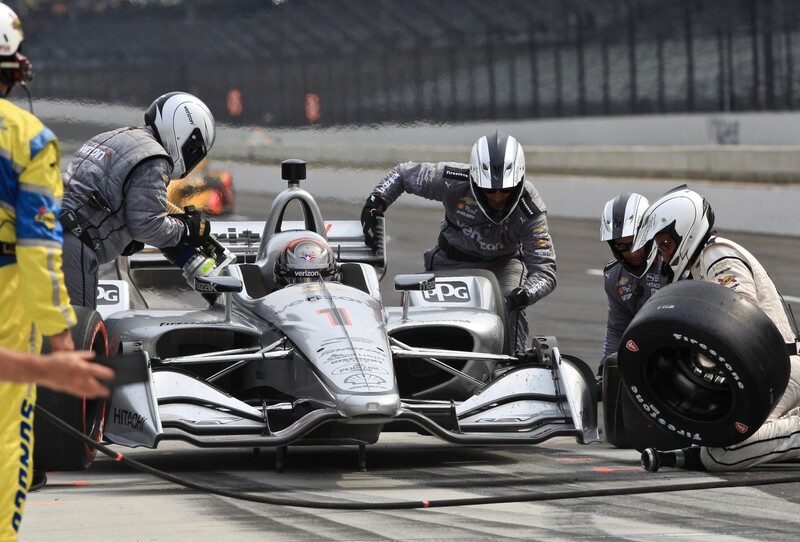 The second caution on Lap 56 for a spin by Josef Newgarden brought on mass stopping in the pits, leading to fuel conservation mode so drivers could last til the finish with no more pit stops. As it happened, three cars littered the landscape on the cool-off lap, after running out of fuel – Rahal, James Hinchcliffe/No.5 Arrows Electronics SPM Honda, and King. Showers flashed all around north of the track, but stayed away … until Lap 72 when rain drops supposedly were detected around various parts of the 2.439-mile road course. No one pitted for tire changes. The sun came out. 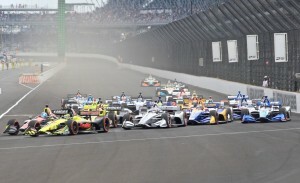 The speedway now closes for two days to convert the track back to its original oval configuration, with the first Indy 500 practice starting on Tuesday. This entry was posted in Motor Sports by Lynne Huntting. Bookmark the permalink.